Recently, somebody informed me I can make a deposit into my bank account by taking a photo of a check, then uploading it from my phone via an app. “Carl, you’re wasting time going to the bank,” they said. Trailers For Sale . . . In another recent conversation, a friend and I were talking about music and how much that has changed. Interesting enough, driving home that evening, I was listening to Roger Miller’s King of the Road from 1964. The song details a free spirited, floor sweeping, cigarette deprived individual who knows the family of every train operator. I arrived home, checked my mail, and saw my copy of Airstream: America’s World Traveler had arrived. I flipped open the first few pages, discovering a bold heading: King of the Road. 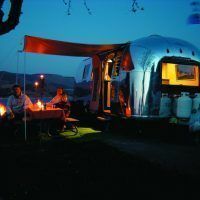 Airstream is America’s oldest and most notable manufacturer of travel trailers, with an unmistakable sliver complexion. The trademark design is as functional as stylish. The Airstream Clipper in 1936, for example, featured a lightweight aluminum body that handled the wind gracefully, improved fuel mileage, and made towing easier overall. Inside, a Pan Am luxury liner feel was accented by sunlight friendly windows. Wherever one could dream to travel, the Clipper eagerly obliged. 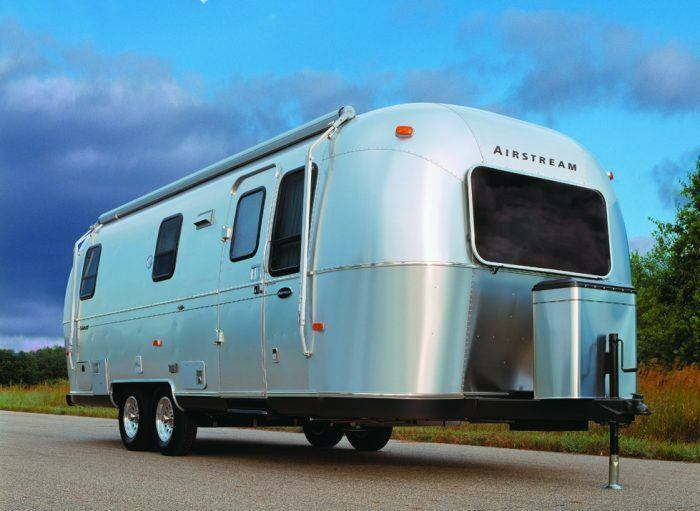 The most curious and carefree adventures were made quite regal by Airstream. The Clipper accommodated four, carried its own water, had electric lights, and cost $1,200. Patrick R. Foster is a widely known and respected automotive writer and historian. He is an authority on AMC and its various sub-brands. Foster has written a number of books on AMC, as well as Jeep and Studebaker. 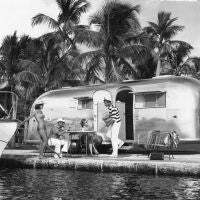 Airstream: America’s World Traveler is some of his finest work. 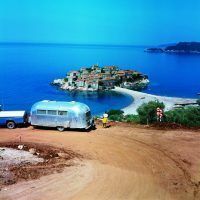 The photography is stunning too, with images provided by Airstream. 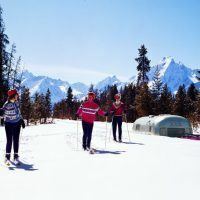 And while such ability is both practical, even enjoyable, there is nothing like savoring the memory free from distraction. No social media notifications, no text message buzz, no selfies. The best photos are in our hearts anyway, were they are developed in a resolution not even the most advanced smartphone camera can match. Just over the horizon awaits the world, and with an intrepid spirit and a trailer hitch, we can have it. 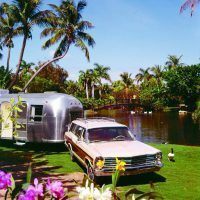 When venturing through Airstream: America’s World Traveler, that feeling is, just like the Airstream legacy, impossible to ignore. *Carl Anthony is Managing Editor of Automoblog and resides in Detroit, Michigan. 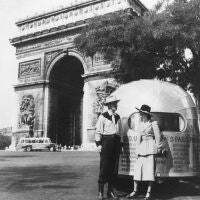 This photo, found in the Airstream corporate archives, depicts an early Airstream trailer, probably circa 1933. Although the man is not identified, it appears to be Wally Byam. 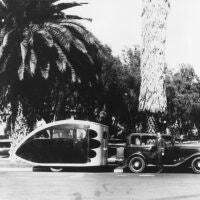 The early Airstream trailers used this ‘teardrop’ design for aerodynamic efficiency. The sleeping compartment was towards the rear of the trailer. There appears to be someone sitting inside the trailer. Wally Byam was a good showman and had a great sense of humor. 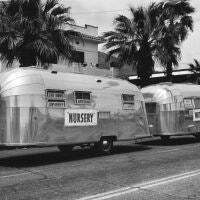 Here he combined both by showing off two Airstream trailers at once- the larger ‘Nursery” and smaller “Mother-in-Law” apartment. 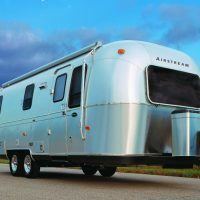 Notice the signs in the windows that point out some of the best features of the sturdy Airstreams. Another great spot to see while in Paris is the Arc de Triomphe, as this western-garbed couple could attest. Begun in 1806 under orders of the Emperor Napoleon, this monument was created to honor his Grand Army’s victories. On the road in Africa, exactly where is unknown. Notice the two men in the left front of this photo carry rifles for protection from lions and tigers. 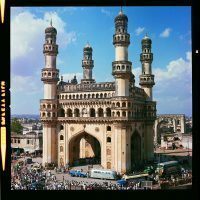 We can spot Andy Charles’ Ford pick-up and Airstream trailer parked in front of a fabulous building, which is the Charminar (sometimes spelled Char Minar) a monument and mosque built in 1591 Hyderabad, Telegana, India. Charminar means Four Towers in the Urdu language. 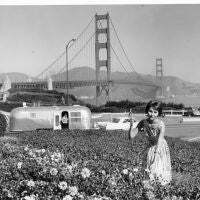 Stopping to pick flowers in San Francisco in 1964, with the Golden Gate Bridge as a backdrop. 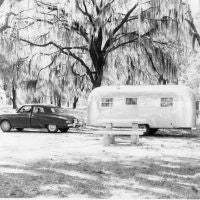 The car is a 1964 Cadillac, and the trailer is an Airstream Land Yacht. The always-popular Ford Country Squire station wagon was another ideal tow vehicle in the 1960’s and 1970’s. 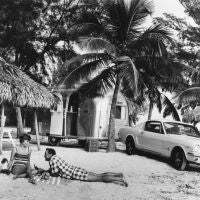 This 1967 model is towing an Airstream in beautiful Hawaii! 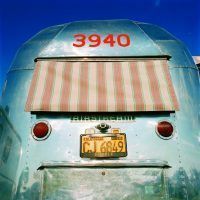 Airstream: America’s World Traveler by Patrick Foster. All images courtesy of Airstream, Inc.
Two of the big advantages of the Airstream trailer is its extra snug insulation and its fine heating system, which combined help to make wintertime toruing possible. We don’t know where this photo was taken- probably Florida- but any woman who looks that good in a swimsuit deserves to have her picture in this book. 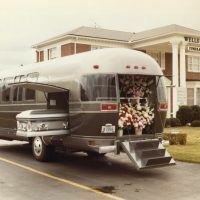 Here’s the exterior view of the Airstream Funeral Coach, circa 1982. It was a decent idea, having one vehicle that could take the place of several. The flowers went into the rear hatch area, as shown, while the casket went into the side carrier space. Mourners rode inside the spacious passenger compartment, which was nicely trimmed and featured individual seats plus a couch at the rear. 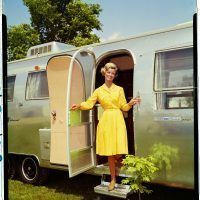 The most luxurious Airstream, the Limited, even came with folding chairs bearing the Limited name. 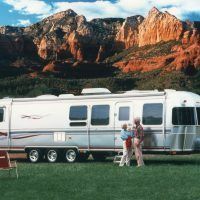 This older couple look very happy as they camp in a lovely spot in view of a majestic range of mountains. 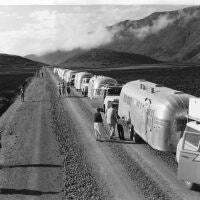 Airstream: America’s World Traveler is available through Amazon and Motorbooks. 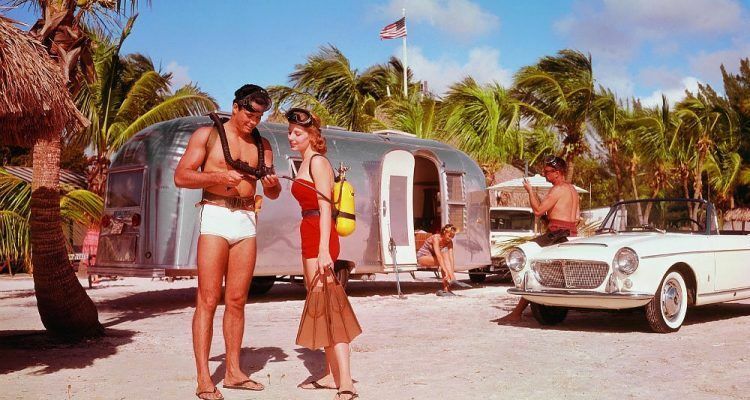 No Comments on "Automoblog Book Garage: Airstream: America’s World Traveler"